(CNN) - Anger over two black men being perp-walked out of a Philadelphia Starbucks continued to simmer Monday, with protests that briefly shut the location down, a sit-in and critical comments from African-American leaders. 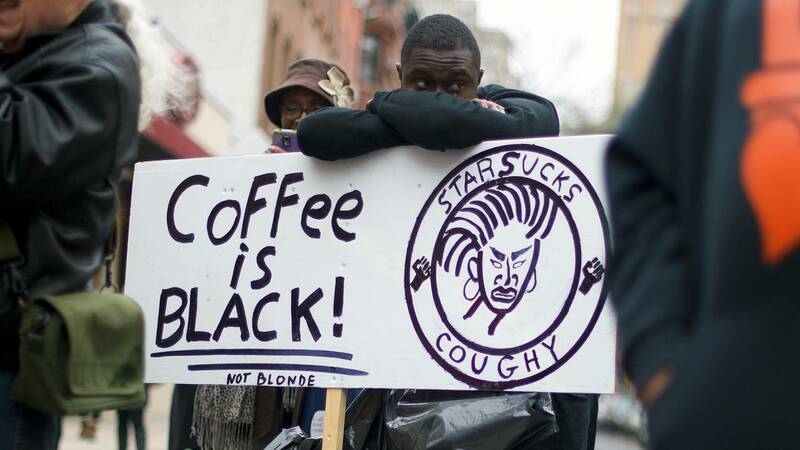 During the early demonstration that forced the store to close, protesters called the mammoth coffee chain "anti-black." The store reopened hours later. As the protests heated up, the arrested men, who were not charged with a crime despite being detained, agreed to meet with Starbucks' CEO Kevin Johnson. And the Philadelphia police commissioner, who is under fire for defending his officers, said the policemen never wanted to arrest the men. The men, who have not been identified, initially asked to use the restroom inside the Starbucks on Thursday but were told the cafe's bathrooms were for customers only. They then occupied a table without making a purchase, which many observers have noted is a common occurrence at the franchise's locations. That manager is no longer working at the store, Starbucks said, but it's unclear if she was terminated or relocated. Philadelphia Councilman Kenyatta Johnson and other African-American leaders denounced the chain Monday afternoon in front of the Rittenhouse Square location, where the incident occurred. Johnson said he met with the Starbucks CEO and Philadelphia Mayor Jim Kenney, but he was "not sold" on the actions Starbucks said it planned to take. "To me it was all lip service," said Johnson, whose district includes the Rittenhouse Square neighborhood. "We want to see action," the councilman said. "We want to see an actual plan to make sure that those individuals that come to and from Starbucks ... are respected, and they can go to the establishment without fear of being targeted because of their skin color." He said he believes if the two men "didn't have sweatsuits on, they wouldn't have been targeted." Johnson said city leaders are also demanding Starbucks engage in diversity and inclusion training and sensitivity training for all workers. "We can't find a reason for them being approached by this except for their skin," said Minister Rodney Muhammad, president of the Philadelphia NAACP. Soon after, faith leaders and others filed into the store for a sit-in led by Philadelphians Organized to Witness, Empower and Rebuild, a community group. The crowd sang gospel songs and chanted before leaving the store. As they prepared to march, one man said: "Starbucks, you can't hide." "We can see your dirty side," the crowd responded. Starbucks' policies, guidelines and procedures will be reviewed by the Philadelphia Commission on Human Relations, the mayor's office said. The city's Police Advisory Commission has also been asked to review all video of the incident and interview citizens and officers at the scene. After meeting with Starbucks officials, including its CEO, Kenney said he believes the company will cooperate with the city's probes. "This is not just a Starbucks issue. This is a societal issue," Kenney said in a statement." People can react differently to others based on skin color, and that is wrong. We have work to do, and we need to do so productively." Hours earlier, a man also led protesters in call and response, in video captured by CNN affiliate KYW. "A whole lot of racism, a whole lot of crap!" The next chant began, "Anti-blackness anywhere is anti-blackness everywhere!" "What do we want?" the man asked. The next chant -- "If we can't get it, shut it down" -- spoke to the demonstrators' demands. They are angry with Starbucks' apology and the company's promise to review its policies. They bristled particularly at the sentence, "Our store manager never intended for these men to be arrested." Why then, posited the protesters -- as did their counterparts on social media -- did the manager call police in the first place? And why, in the video of the arrests that went viral last week, is the manager not seen intervening, despite several customers taking the arresting officers to task? In the KYW video, a woman protesting in the store Monday tells customers, employees and her fellow protesters, "We are here today not just to bring attention to what Starbucks has done but to bring more attention, as if we needed it, to what the PPD continues to do. So we are very clear that corporations aren't here for us and we're also clear that the Philadelphia Police Department is not here for us, either." Other protesters off camera chime in, saying, "Not at all" and "Never been, never been." Police Commissioner Richard Ross has said previously his officers did nothing wrong and performed only "a service that they were called to do." On Monday, in an interview with CNN affiliate WPVI, Ross called the arrests "very unfortunate" and said his officers tried to avoid making an arrest but were left with no choice but to handcuff the men. It's common for officers to respond to reports that someone won't leave a business, he said, adding that, typically, the person or people leave before police get there or when they arrive. "Most people will move just simply because we tell them the proprietor wants you to leave. In this case, that was not the issue, and that's for them to decide why they didn't do that," he told the station. "There are laws on the books that we have to follow. If we had our druthers, we wouldn't (have) come there in the first place. That's just keeping it simple." The protesters did not appear to see any temperance in the officers' actions, however. On their Facebook page -- titled "Shut Down Starbucks!" -- they alleged the Philadelphia police "have once again demonstrated their inherent white supremacy and inability to serve the black community." They demand the Starbucks manager who called police be fired and that the officers who arrested the men face the same fate. They also want an official apology to the men and the black community at large and demand that "Starbucks create and publicize a new policy that expressly disallows calling the police on citizens," according to the Facebook page. "We know that you don't have the power to change everything. You're just a figurehead, but we're going to get to those in power and we're going to make sure that we shut you down," a protester told Hymes in the KYW video. "We put (the manager) in a position that did not allow her to be set up for success or those two men," Hymes told the crowd, explaining that Starbucks' policies, and not its employees, drove the arrests. A man in the store yelled, "They got a picture in the system now! They're fingerprinted!" Asa Khalif of Black Lives Matter in Pennsylvania refused to let the manager off the hook, telling Hymes, "She's a racist bigot. I'm sorry. I'm calling her that. Until that element is removed from this store, there cannot be any dialogue. There can only be protest." Someone in the background asked Hymes, "Can you understand the lack of empathy for the manager when...," but she didn't finish her question. "At this time, we'll ask that you step outside," Hymes told the protesters. In an interview with WPVI, Khalif summed up protesters' anger. "Black people are met with aggression every time we are encountered with police. What that manager did was she put those men in danger," he told the station. Starbucks CEO Johnson said in an apology posted on Facebook that he believes "that blame is misplaced." On "Good Morning America," he said he did not want to "point blame" for the arrests. "My responsibility is to look not only at that individual but to look more broadly at the circumstances that set that up, to ensure that this never happens again," he told "GMA." The timing of the meeting between Johnson and the two men who were arrested has yet to be determined. A spokesperson said it will ideally take place this week.